Oklahoma Connection | Warren was born in Norman, Oklahoma. At 15, her maternal grandmother drove a wagon for her fiance' in the Run of 1889. At 16, they married and built houses and Indian schools across the Territory, and later, the state. Her paternal grandfather ran a hardware store in Wetumka, where he and his wife helped build the Methodist Church. Elizabeth Warren was born in Norman and moved to Oklahoma City toward the end of her elementary school years. She graduated from Northwest Classen High School at 16 years of age, where she was a state champion and legendary high school debater. After obtaining her B.S. Degree from the University of Houston in 1970 and her J.D. in 1976 from Rutgers Law School in Newark, New Jersey, she embarked upon a career in bankruptcy and commercial law that is nationally renowned. Warren, who can track both sides of her family in Oklahoma long before statehood, is a shining light in the United States legal profession. As important as her sterling professional qualifications is the fact that she proudly tells everyone she encounters that she is “an Okie to my toes.” She says “being an Okie keeps me grounded, reminds me what is important in life, and why I work hard.” During the Obama Administration, Warren was the Assistant to the President and Special Advisor to the Secretary of the Treasurer on the Consumer Financial Protection Bureau. 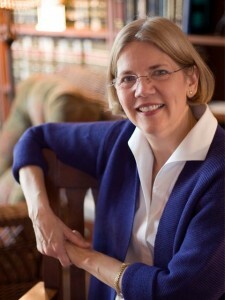 See pictures of Elizabeth Warren and other media HERE.